A New Base For Singapore's Fighter Jets in New Zealand? An upcoming military exercise comes as the two countries are mulling a new deal. On August 3, New Zealand Defense Minister Mark Mitchell confirmed that Singapore’s fighter jets would be participating in an upcoming military exercise between the two countries. The news came as the two sides consider options for basing these aircraft in one of the country’s largest airfields for training as part of their broader effort to further their military cooperation in the coming years. As I have noted before, Singapore and New Zealand have had a defense relationship that dates back decades, with both joining the Five Power Defense Arrangement (FPDA) back in 1971 along with the United Kingdom, Australia, and Malaysia. But the two sides have been also making efforts to further boost defense collaboration. When they held their inaugural defense ministers’ meeting in New Zealand in January 2017, they discussed stepping up cooperation through various ways including establishing an annual air force staff talks, starting an education and training working group and operational working group to explore new cooperation initiatives, and mulling further training opportunities. One of these opportunities had been for Singapore to set up a pilot training base at Ohakea Air Base, New Zealand’s third largest airfield, as the land-scarce city state continues to look for other partners that can provide room for it to train its armed forces. Early discussions had already been underway, though defense officials had said that they would need to look into specifics, such as logistical requirements, costing, and the views of the local community (See: “Why is Singapore Eying a Military Base Deal With New Zealand?”). But as the move is being considered, Singapore’s fighter jets have continued to feature in engagements involving the two countries. In February, for instance, two Singapore F-15s were at the Ohakea Air Base for celebrations commemorating the 80th anniversary of the Royal New Zealand Air Force. 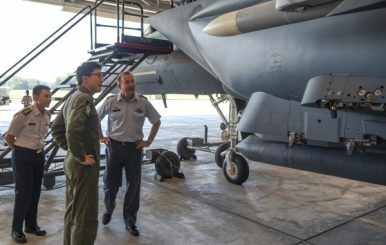 And in June, when New Zealand’s air force chief Tony Davies paid a visit to Singapore, he viewed a static display of the F-15 fighter aircraft at Paya Lebar Air Base. On August 3, Mitchell, the defense minister, announced that a Republic of Singapore Air Force (RSAF) training exercise hosted by the Royal New Zealand Air Force would take place at Ohakea Air Force base from 30 August to 25 September. According to Mitchell, the deployment would include six F-16D+ fighter jets, about 110 personnel, and associated support equipment. The contingent would be based in Ohakea but will carry out training missions throughout New Zealand, including day and night flying, using New Zealand air weapons ranges, and conducting other training at both high and low altitude. In his carefully-worded statement, Mitchell also acknowledged the ongoing proposal for accommodating F-15SG fighter jet training at Ohakea, noting that while both countries were currently carrying out a range of studies to make an informed decision on a possible proposal, the two countries had “similar values” and “it could be a good fit”. The exercise, he noted, was timely in that regard because it would provide valuable data for the process and how it might work. That said, he also acknowledged that “there is a lot of work to be done” before the proposal can be fully realized, which would involve not just the New Zealand national government but also local government and communities. As Singapore has discovered in the case of its training agreement with Australia reached last year, such deals can quickly run into domestic headwinds in spite of their enduring strategic logic, and such engagement can be critical in managing these potential challenges early on (See: “The Enduring Logic of the New Australia-Singapore Military Training Deal”). Why is Singapore Eying a Military Base Deal With New Zealand? A closer look at a new potential opportunity for the city-state to train its fighter pilots. What’s Behind the Nixed Singapore-New Zealand Fighter Jet Base Deal?Where Are Singapore-New Zealand Defense Relations in 2018?Joint Ministerial Meeting Puts Australia-Singapore Defense Ties in FocusDefense Chief Introductory Visit Puts Singapore-Australia Security Ties in FocusWhat’s Behind Singapore’s F-35 Fighter Jet Decision?